BEACHFRONT STUDIO Cottage located on a breath taking oceanfront property on the Windward side of Oahu. Cottage is UPSTAIRS. A scenic 45-minute drive from Honolulu International Airport, A short 10-minute drive to Kualoa Ranch,10 min.-to the BYU-HAWAII CAMPUS and THE POLYNESIAN CULTURAL CENTER in LAIE, TURTLE BAY GOLF RESORT in KAHUKU is just a 15-minute drive, KANEOHE MARINE CORP AIR STATION is a short 40-minute drive,just a short 30-minute drive to Kaneohe & Windward Mall, and 'if you must go to Waikiki' this drive will take about an hour. A safe beach for swimming, snorkeling, or you may just want to sunbath around the pool, sit under a coconut tree and do 'NOTHING', watch the sunrise as you sit at the dining table of this cozy cottage, sipping on your favorite morning drink, and in the winter months you can watch for Humpback Whales frolicking beyond the reef. 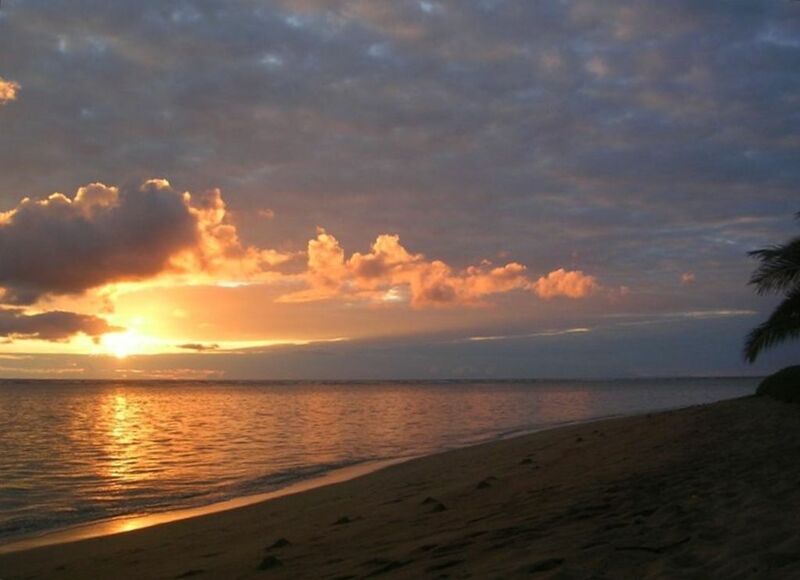 Punaluu Beach is a safe Beach for kids of all ages all year round. This studio cottage is UPSTAIRS, this makes our cottage very private, if you want to sleep with the windows open you can! you can leave the windows open to enjoy our magnificent ocean view. Cottage can sleep up to 3-people comfortably, A queen bed in the sleeping area can be closed off from the living/dining room for privacy, a trundle bed in the living/dining room, dining table that can sit up to 4-people. OTHER AMENITIES INCLUDE: free Wifi fast speed internet,phone with free local calls, cable TV, book library for all ages, fully equipped kitchen, microwave, refrigerator, linens, beach towels, sand chairs, ice chest, snorkel gear free use of washer/dryer(shared) Free Reserved Parking. BBQ(shared) swimming pool(shared) on the grounds you will find tables and lounge chair. Kualoa Ranch is 10-minute's South from the cottage, has many activities and tours for a fee and most have to be book way in advance. They also offer lunch, snacks, and a gift shop. NOTE: for immediate assistance please call, leave message. picnic tables and lounge chairs on the grassy area shared with other guest. Pool is 6Ft. deep, common area shared with other guest. The location is great. Amazing views from the room. Close to grocery stores, food trucks and assorted eateries. Just up the road is Polynesian Cultural Center. This is 5 star review based on location and description is exactly as stated by owner. This isn't a luxury condo but has everything you need and extras. Would highly recommend for those that want to stay very close to beach-Ocean and away from highly populated Waikiki area. Quaint and next to the beach! Beautiful property. If you want to be away from the city and quiet at night this is for you. We loved this place! It was comfortable and so convenient to enjoy the surprisingly uncrowded beach. It was so nice to have snorkel and beach gear provided. The kitchen was nicely stocked and having a few simple condiments provided was a nice way to save a few bucks. As a family of four with almost grown girls, it was cozy but spacious enough for us. The area was not as fancy as some of the other places that we drove through but that is really my preference. I would rather be around that than a sheltered pretend environment. We ate at the food trucks a lot but also cooked most of our meals. My favorite part was the huge majestic see turtles right out your front door. My only slight complaint would be that 2 rolls of toilet paper for a family of 4 for 5 nights with a note to restock what was used seemed a little on the cheap side. Other than that it could not have been better! Lovely place; great location; VERY comfortable (especially the beds!). Please let the owner know that a front window leaks a bit and that's why a towel is there. I found the instructions very useful. The place was great, quiet, it looks exactly like in the pictures. I’m happy I found it available for my vacation. This was my first time in Hawaii and I was not disappointed. Our cottage looked like it came straight out of a Better Homes & Garden Magazine. It was decorated and so cute. It had everything we needed. The queen bed and a day bed were comfortable. The kitchen had everything needed to stay for a week. There were lots of things to use at the beach. The only thing we had to buy was toilet paper extra. My luggage outside zipper broke on the flight and I lost all my lotion, and hair product but the bathroom had all the things I needed. They even had lots of spices and some extra cans of food on the shelves. There were lots of fans to make it comfortable. We couldn't get the internet to work the first day but figured out if you just unplug the modem and then plug it back in, then it worked fine. The beach was amazing and there were beautiful sunrises each morning. We even met some locals fishing for octopus and they gave us an informative low down on how it was all done. Laundry facilities were in the back of the cottage for your use. Make sure you don't park your car in backwards because we did and got a warning ticket. It was written in the information so it was our own fault. The location is great because it was only 5-10 minutes from the PCC and The LDS Temple. We drove up to the North Shore a few times and had the famous Giovanni shrimp and then went to the market at the stadium (which was a nightmare trying to find but got a little something for the family back home and more) We travelled around the whole island and were always grateful to return to our little paradise on the beach after trying to drive around Honolulu. We needed a better map and because we were Canadian, we didn't want to turn on our cellphones for directions but after a few days we figured things out. We flew to Kauai and stayed in a really nice resort for our next place but it was not the same island feel as our stay at Henrietta's place. I would definitely stay here again when I return. At Kualoa Ranch you will find tours and activities for all ages, 10-mins. South from the cottage. BYU CAMPUS and POLYNESIAN CULTURAL CENTER 10-mins. North from the cottage. Windward Shopping Mall 16 1/2 miles South from the Cottage, corner of Haiku Road and Kamehameha Hwy.